Triton is recalling one of its electric showers, the Safeguard+ thermostatic electric shower, because it could pose a serious risk to users. An announcement from the company warned that ‘a part of the electronic circuit board of the Safeguard+ shower may develop a fault which could lead to overheating and a potential risk of electric shock or fire hazard’. 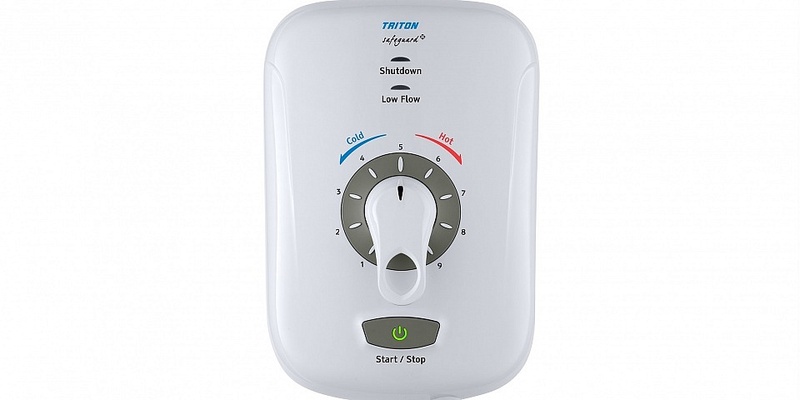 Which Triton showers are affected? The recall only applies to the discontinued Safeguard+ shower. Affected units start with the product code CSGP0 and have a date code stamp between 05/14 (May 2014) to 12/16 (December 2016). This date code is on the product rating label located on the underside of the product, as shown in the image below (the date stamp is highlighted in yellow). If you believe you have a Safeguard+ electric shower with a date stamp that matches those affected, you should contact the Triton Service team on its freephone number: 0800 0154 145. Alternatively, you can email your contact details, including a daytime phone number, to safeguard@tritonshowers.co.uk or you can fill in this simple online form. Triton’s Service team will then call you back. If required, a Triton engineer will be arranged to carry out a safety inspection to check and correct any issues. This visit is free of charge and will be undertaken by one of its qualified engineers. It should take no longer than 15 minutes to complete. arrange for the product to be collected, or send out engineers to make repairs. You should not be charged for any recall repair work. On some occasions, the manufacturer may offer you a replacement at a greatly discounted rate instead of a repair, depending on the fault and the value of the product. We’re committed to keeping dangerous products out of Britain’s homes. You can help by signing our petition demanding the government reform the UK’s deficient product safety standards.